The previous posting here described some items that I have collected so as to complement my old 1941 Buick. Those items and many more are available to enhance any old car you might have. Most of the items I discuss with this blog edition will be specific to the 1941 Buick but similar items are surely available for any other car. So let’s discuss car color. You may think you know what the color of your old car is but then there may be a surprise or two when you dig a bit deeper. Most cars have an ID plate that describes, usually in code form, the color that the car left the factory in. That code is always helpful so long as you have something to interpret it with. That is where an original Paint Chip chart comes in handy. Such a chart will have individual blocks of paint attached to a page that likely came out of a three-ring binder. It will supply you with the codes and the names of the colors. The plate on the firewall of my ’41 indicates a paint code of 560. The Dietzler paint chart interprets that as ‘Black’. My car is not black. It is a two-tone green. After consulting the paint chips it appears that I have an upper color of Mermaid Green (580) and a lower of Ludington Green (570). 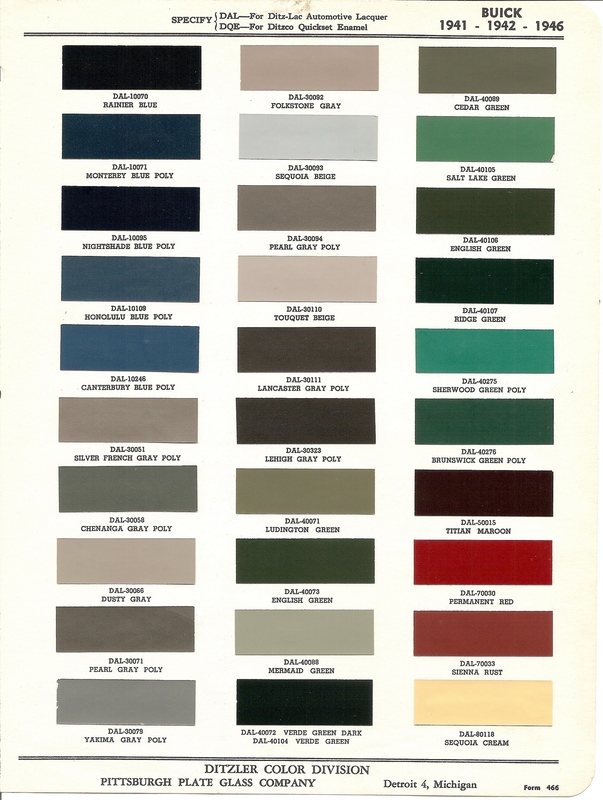 The chart also indicates that Mermaid Green was paired with Cedar Green, not Ludington, to create the two-tone code 579. Was a lower color of Ludington Green also an option? I do not know. Either there were other options, I am not reading the colors right, or someone who did a repaint made the change. I have more research to do. Does your car have a glove box? There was a time back in the ’70’s when some low-end cars had just a shelf but no locking box. Older cars, such as mine, did have a glove box. The clock is a nice beige and cream color that matches the main instrument panel. Notice the machine-turned door of the glove box. It was usually cloth-lined and did not come with gloves. It did come with a surprising number of items though (as most cars do even to this day). 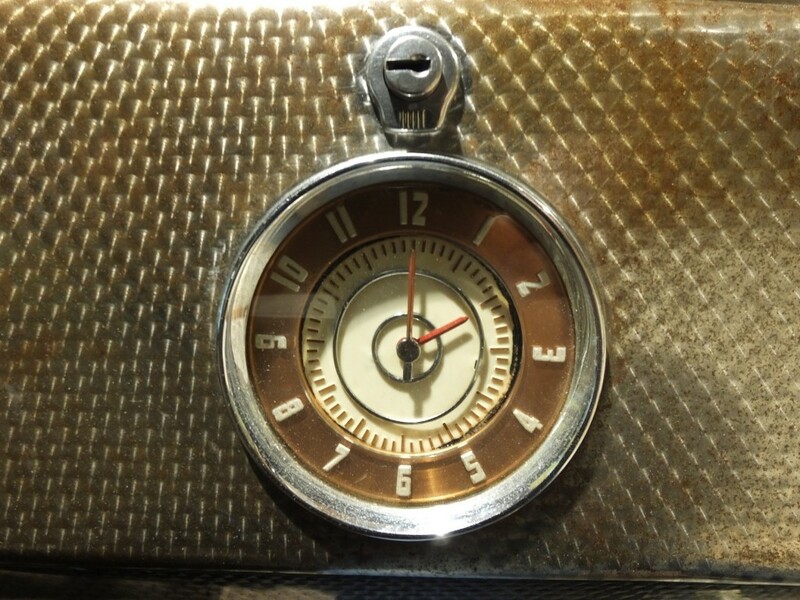 The door of the ’41 Buick glove box may display a color-coordinated clock in the middle of it. Otherwise the hole for the clock will be taken up by a ‘clock delete’ medallion. 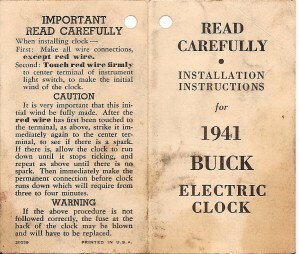 The Electric Clock instruction manual. There were two different suppliers that year. Notice the complicated directions for starting the clock. The new owner was provided with a clock installation and operation manual. If you look at the accompanying photograph it will be evident that it took a bit of work to get the clock running. 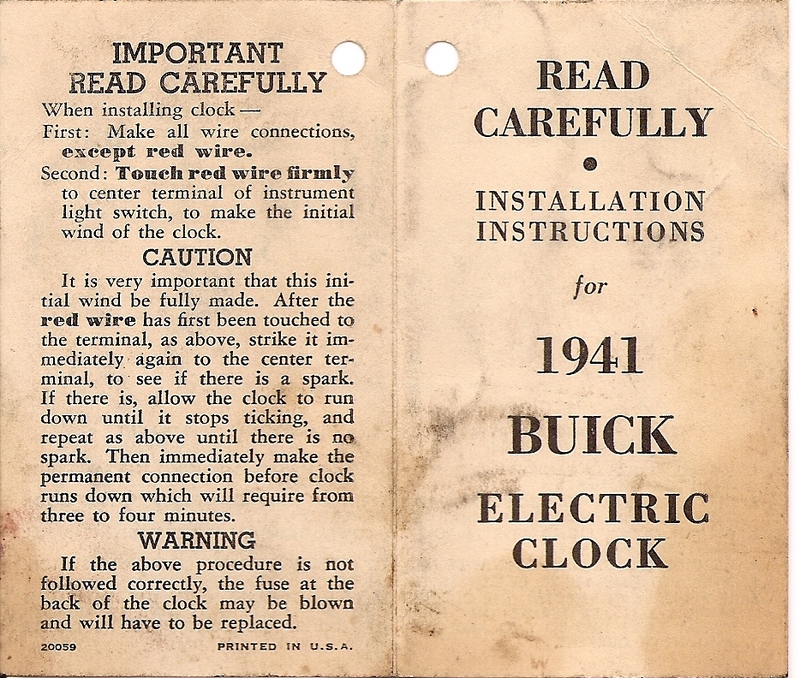 There were two different manuals because Buick sourced clocks from two different suppliers. The manufacturer name (Jaeger made the one in my car) will be found on the back of the clock. 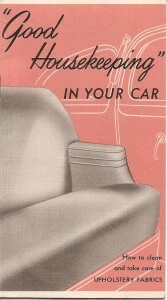 The glove box also contained the Owner’s Manual. 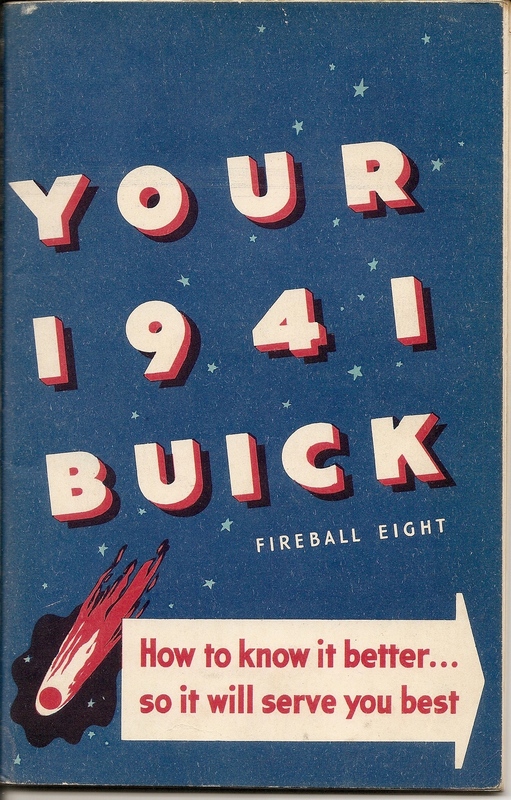 In the 1940’s an Owner’s Manual was comprehensive and easy to understand. How comprehensive was it? Buick went so far as to explain how a clutch functioned! For 1941 the manual featured the title “YOUR 1941 BUICK -Fireball Eight“. There were several editions of the 1941 manual, each containing 104 pages. The first caution a new owner saw upon opening the book was what looked like a handwritten message on the inside of the front cover. Most versions said “Suggest you read “use of jack” on page 60″. That was good advice because the jack was difficult to use and in my opinion not very safe. Any slight rocking or rotation of the wheel could easily dislodge it. One somewhat rare variation of the manual has a different inscription inside. It says ““Suggest you read short wave radio information page 97. For “use of jack” see page 59“. The shortwave radio is a very rare option! Then there is the mystery of pages 51-54. They are missing from many original manuals. 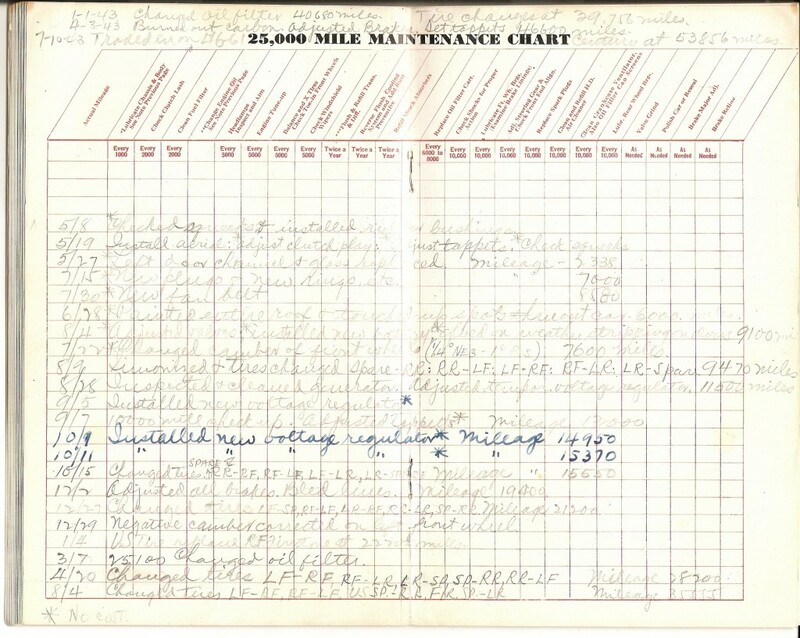 After adding several manuals to my collection I found that these pages consisted of a “Maintenance Chart” with a grid for logging things such as oil changes and visits to the dealer. Most people just tore it out and kept it separate from the manual. I now have one example that was filled out and another that was never used. The used one makes interesting reading. If you have a complete manual there will also be a fold-out “Chassis Lubrication” chart tucked in the back. When you buy a used manual for your car (don’t even think about buying a reproduction – all the charm will be missing) there are often extra goodies included. One common item is the Good Housekeeping upholstery booklet. 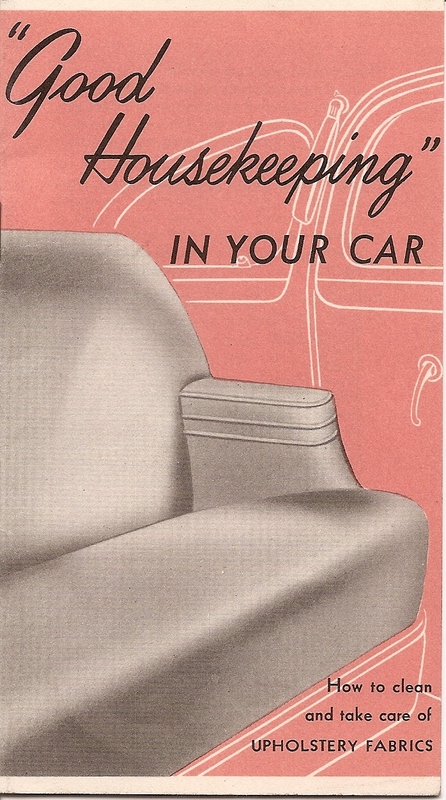 It explains how to keep those seats looking their best. 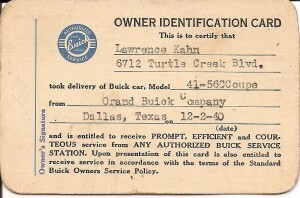 As a new Buick owner you were also entitled to a letter from the current Vice President and General Sales Manager of Buick. If you were successful at starting up the clock, beginning the maintenance chart, and learning how to jack up the car you might want to sign your new Identification Card. The ID card I have is an original that once belonged to Mr. Lawrence Kahn. He was the second president of the famous E. M. Kahn & Co. department store of Dallas, Texas. 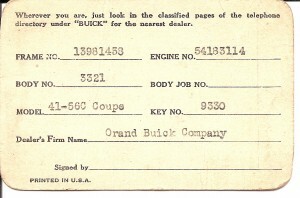 The card indicates that the car was purchased on 12-2-40 and that it was a model 41-56C. This means it was in the 50 Series (called the ‘Super’) and that it was a 2-door convertible. Of course you could buy an unused reproduction card for your car, but where would the fun be in that? Matt of Harwood Performance has done a nice study of model identifications and you might want to take a look. Then there are the Buick dealers. It’s great fun to find out where your car was purchased and if the dealer is still in business. 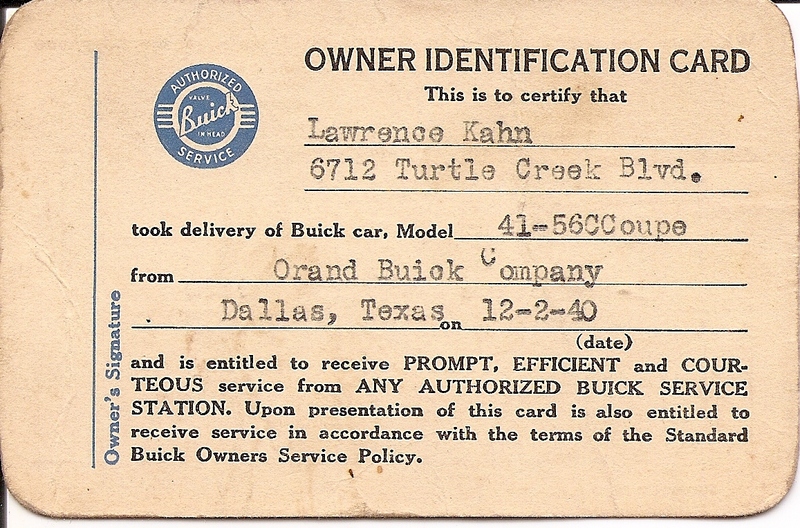 I have none of that information for my car so I tend to be interested in all old-time Buick dealers such as Orand Buick that sold the convertible to Mr. Kahn (see above). It appears that some customers were delinquent on payments (some of which went back to 1938). All of these lucky folks paid up (I have the original receipts). What happened if a customer was late on payments? Well, I learned a bit about this when I luckily won a bid on some correspondence from Northampton Buick Co. in Northampton, MA. It seems that they often had difficulty managing collecting payments on their own and were forced to use a collection agency. 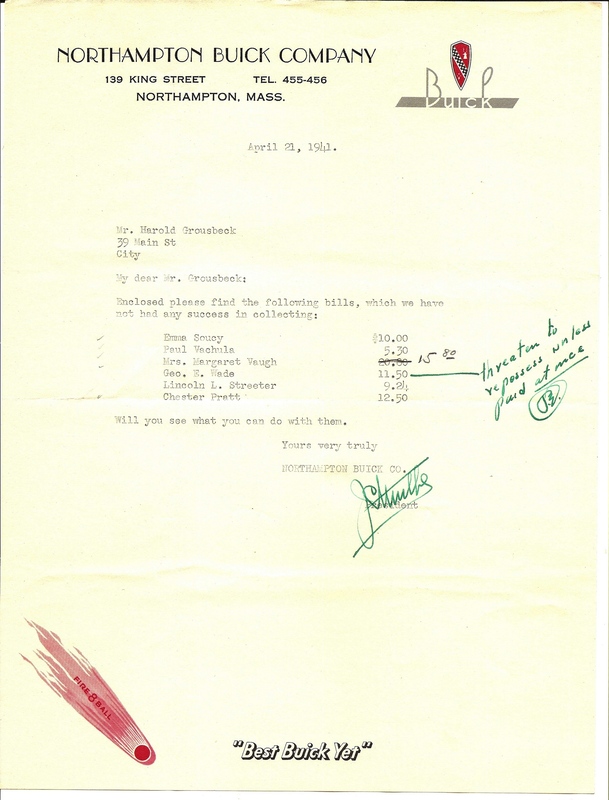 The document pictured here displays the colorful stationery (“Best Buick Yet”) used. There is also colorful language such as the margin inscription “threaten to repossess unless paid at once“. The records I have indicate that all parties paid at once. The final item I have today is an inspection sticker. If you are lucky you may find one for your particular state. 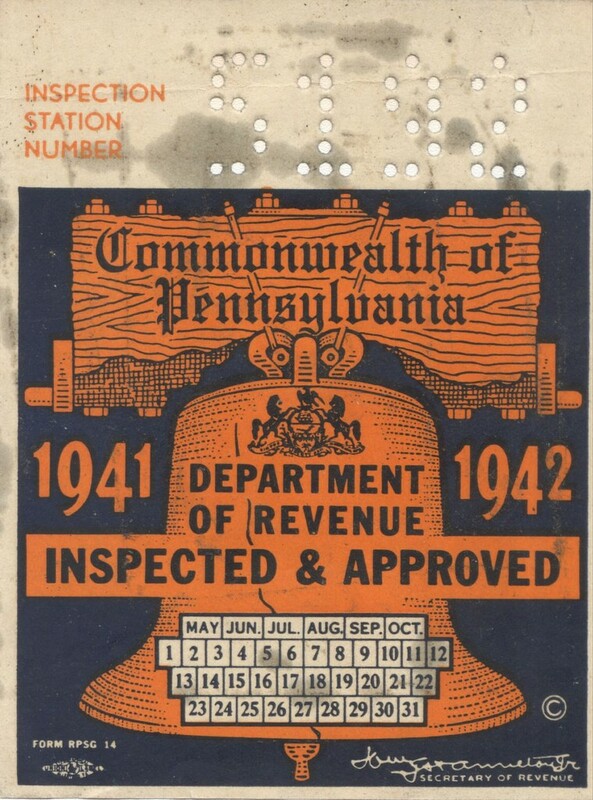 I found one for Pennsylvania (I live in RI) that is unused and dated 1941. It would look nice on my car window. I may just print out a copy and use that. The original will stay in my Buick Album! 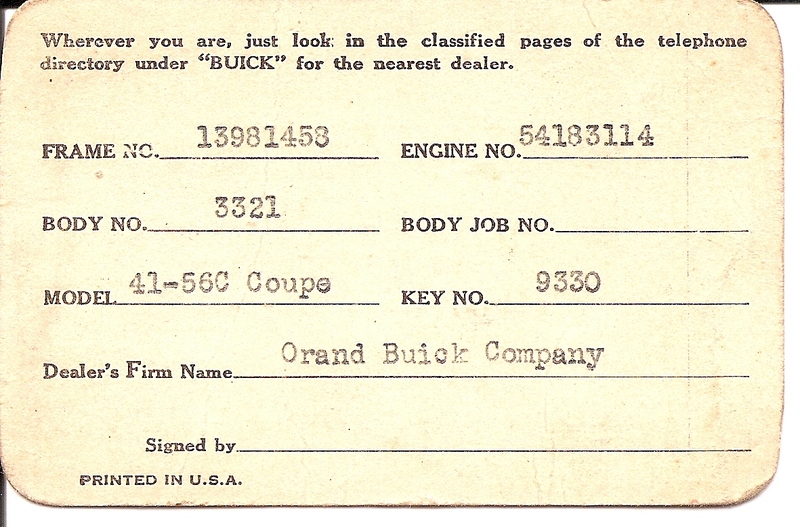 This entry was posted in 1941 Buick Roadmaster, Occasional Commentary and tagged 1941, box, Buick, collectibles, glove, Kahn, lubrication, maintenance, manual, paint, RI. Bookmark the permalink.